Although it's the 1953 Seeburg M100C Jukebox that turns 60 years old this year, the 1946 Wurlitzer 1015 predecessor is what most people associate with rock and roll. The jukebox — sometimes called the "bubbler"— has become as iconic as the 1940-50s soda and malt shops that once housed them. More than 56,000 "bubblers" were sold in their first two years alone, briefly transforming the 100-year-old instrument manufacturer into the leading jukebox brand (until Seeburg eventually unseated it in the mid 50s). The bubbler might have held the lead longer, but Seeburg's 100-play offered more choice than the 24-play original. Today, the Wurlitzer-inspired design doesn't have any technological limitations. 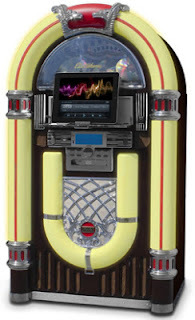 The modern jukebox can hold as many songs as any smartphone because the USB connection opens up digital libraries. And if you don't have a digital library? The jukebox plays CDs or tunes in FM stations. The Electrohome Kinsman is a reasonably faithful reproduction. Although not perfect, the full-sized 44-inch tall, 75-pound recreation does comes close to the original. Redesigned by Electrohome, a 100-year-old Canadian company originally known for portable phonographs and old wooden console television sets, many of the most iconic elements remain intact such as chrome accents (with volume controls) and neon lighting despite everything being modern. The neon lighting, for example, is upgraded. A separate remote provides for touch pad control over the lighting while the primary remote controls the jukebox. The lights can also be set to fade, change colors or strobe. Both remotes can be stored on magnetic panels. Smart phones and tablets connect easily enough to both a USB charging port and AUX input, with most connections hidden behind a drop-down selection panel. The only connection that doesn't is a front facing earphone jack. (Although I don't see many people ever using that jack.) The built-in 40W speakers carry a surprisingly warm sound, well suited to rock and roll. Another feature that doesn't get mentioned enough can be found on the back panel. For anyone who likes the look but wants an even bigger sound, the jukebox does have external speaker outputs hidden in back. Likewise, the jukebox has several surprise functions. 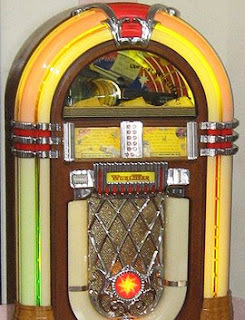 Besides playing music, this jukebox was designed to allow recording MP3s and SD/USB from the CD or AUX input. And while I didn't have a chance to try it out, it seemed good enough to get the job done. The FM radio controls can also act as an equalizer, with five preset sounds, namely classical, jazz, rock, pop, and flat. Hands down, it's a splendid blending of everything new and everything old. It's also reasonably priced overall, a fraction of the cost it would take to purchase a custom-built reproduction or vintage restoration jukebox. In terms of the look and sound, it is the real deal for the modern listener. Of course, if the price point still seems like a steep investment, there are other options. Desktop versions cost significantly less and have a much smaller footprint. They are more cute than functional but I found one that might measure up. The Crosley iJuke is cuter than the classic floor model. The trick here is to find the right one because Crosley produced several renditions of the scaled back iconic design. The best of them, called the Crosley iJuke Premier, has a paprika wood finish and an iPod dock set on dock in the front. It also includes an auxiliary input to work with other MP3 players and outputs for external speakers for better sound quality. The external speaker output was a good idea as other editions of the iJuke seemed to struggle with sound quality. Then again, the iJuke was never designed to replace a Bose or comparable system. It was made for the vintage aesthetic, one for the iPod (and some iPhones) and one with a front mounting CD. Overall, Crosley does a fine job with its vintage-inspired electronics. Founder Powel Crosley himself was an inventor who always thought two or three steps ahead of everyone else. After making an impossibly inexpensive radio, he re-imagined everything from turntables to automobiles, including one that got 50 miles to the gallon in 1939. The Electrohome Kinsman Punches 6.8 On The Liquid Hip Richter Scale. The Electrohome Kinsman is one of the best sounding, smartly designed and modernized jukeboxes on the market. Given that most working Wurlitzer originals and custom replicas start at around $12,000, Electrohome has done a fine job capturing the spirit of the original. You can find an Electrohome Kinsman Jukebox at Amazon for around $1,500. If you are willing to preorder the Electrohome Kinsman Jukebox from ShopTronics, the manufacturer offers an extended warranty option. 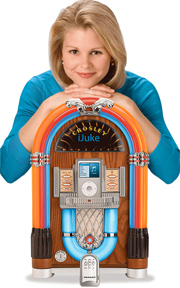 The Crosley iJuke Premier can also be found on Amazon (as well as the other models mentioned).